For over 30 years many textile rental companies have trusted Hunt Textiles as their primary supplier of wholesale linen. Whether it is a single route linen supplier or nationwide publicly traded company, our customers continue to recognize that Hunt Textiles delivers a consistently better quality product at a price that is fair. 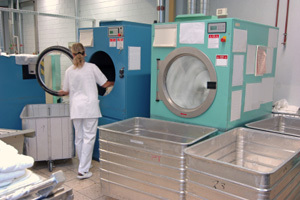 We understand that as a textile rental operator, your real cost in buying product is not the dollar amount on the invoice but how many times you can launder and rent that particular item. Just one more laundering makes a more expensive textile item cost less to own than a cheaper under performing product. Several more launderings and the product costs even less to own! By working closely with financially stable and quality conscious suppliers who manufacture to our exact specifications, Hunt Textiles truly delivers products that cost less to own. Bar Mops, Herringbone Towels, Shop Towels, and Microfiber Towels all in a variety of weights and sizes. Consistently better than competition. Table linen that is engineered with today’s textile rental operator in mind including Hunt Textiles exclusive MJS line as well as the full line the full line of Milliken products. Bib Aprons, Bistro Aprons, and Waist Aprons crafted of our MJS fabric. T130 Muslin to 300 plus thread count Sheets and Pillowcases, Hunt Textiles has your bed linen needs covered. We supply many other items to the textile rental industry including Dust Mops, Wet Mops, Laundry Bags, Fender Covers, and much more. We pride ourselves in being able to supply the hard to find items as well. If you are possibly looking for a new linen supplier for your textile rental operation, try Hunt Textiles the next time and see why not only our quality products but unparalleled service has made us the number one choice of many textile rental operators over the last 40 years.